Lebkuchen, also called Pfefferkuchen, is German gingerbread. These cookies are either rectangular or round, they have a sweet, lightly nutty taste, and their aroma is spicy, a bit like nutmeg and allspice. They are usually soft with a slight crunch from chopped nuts. The Lebkuchen is a traditional Christmas cookie, which is often enjoyed with a cup of tea or coffee. There are many regional variations to the Lebkuchen, but the most well-known is the Nürnberger Lebkuchen from the city of Nürnberg. Unlike the Brown Lebkuchen variety, the Oblaten Lebkuchen have a relatively short shelf life. They will hold their aroma and softness for about 6 to 8 weeks. It is best to keep them wrapped in the original packaging or in a plastic container and to store them in a cool, dark place. But, the fresher they are eaten, the better they taste. If the Oblaten Lebkuchen have become dry, place them in a plastic or glass container and add a freshly sliced piece of apple. Seal the container with aluminum foil and a rubber band. Let it stand for a day but not longer than a day so no mold forms. The Lebkuchen will absorb the moisture from the apple making it soft again. If your chocolate Lebkuchen look like the chocolate glaze has melted, this won't hurt the quality or taste of the cookies. This can happen from being shipped or transported in warm temperatures. 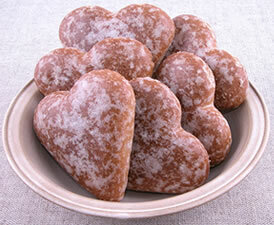 The name "Lebkuchen" comes either from the old German word "lebbe" (very sweet) or from the Latin word "libum" (cakes). The history of the Lebkuchen begins with the Honigkuchen (Honey Cake). The Egyptians, around the year 1500 BC, baked these cakes to be placed in the graves of kings. The Egyptians believed that honey was a gift for the gods. The Romans called their honey cakes "panus mellitus" (sweet bread). They not only used honey as a sweetener in the dough, but they also glazed the cakes with honey. The Lebkuchen that we know today was originally founded in Belgium. It was introduced into Germany through the city of Aachen, where it was then taken over by the Franconian (fränkishe) monastaries. It was the nuns that created the Lebkuchen shapes that are used today. As "Pfefferkuchen," the cookies were introduced to the city of Ulm in 1296. Later in 1395 they were discovered in the city of Nürnberg, where they were baked by the local monks. The cookies were first called "Lebkuchen" in 1409. The seasonings needed for the Lebkuchen were not available locally and had to imported from distance lands. Because of this, the Lebkuchen grew in popularity mainly in those larger cities that had significant trade partners. This included the cities of Nürnberg, Ulm, Cologne (Köln), and Munich (München). The reputation of Nürnberg as the Lebkuchen-Bakers grew quickly. The city had an advantage: the local Lorenzer Forest. This was a colorful, foresty countryside filled with many different kinds of flowers and blooms - the perfect environment for bees and honey production. Likewise, the city imported the required seasonings from Venice and the Orient, giving bakers easy access to all the necessary ingredients. Commerical production of the Lebkuchen in Nürnberg began in the 14th century. 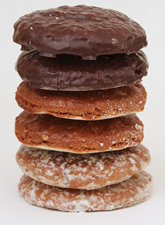 In 1643 the city officially recognized the Lebkuchen-Baker profession by creating the "League of Lebkuchen-Bakers." In 1645, the league created strict guidelines that commerical bakers had to follow in order to sell their lebkuchen. Industrial production (by machine) of the Lebkuchen began in 1867. "Oblaten" are thin wafers. Oblaten Lebkuchen are cookies in which the dough is baked on a thin wafer. Historically, this was done to prevent the cookie from sticking to the cookie sheet. These are the highest quality Oblaten Lebkuchen available. They must have at least 25% almonds, hazelnuts, and/or walnuts (no other kinds of nuts are allowed). Likewise, they must contain no more than 10% flour. These are Lebkuchen that are baked in the city of Nürnberg, and are worldwide the most well known. They are often baked on Oblaten (thin wafers), and they are known for their light, soft texture. Marzipan is often an ingredient of these cookies. These are Lebkuchen onto which a picture is drawn or imprinted. These cookies are made from a honey or syrup dough. 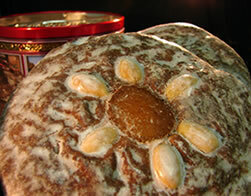 The dough is either molded, cut, or formed and it is baked without Oblaten (thin wafers - see "Oblaten Lebkuchen" above). The baked cookies are often covered with a sugar glaze or chocolate. These cookies get their name from their very light color. It gets this color from a high amoung of whole eggs and/or egg whites in the dough. They are usually decorated with almonds and/or candied lemon and orange peels.